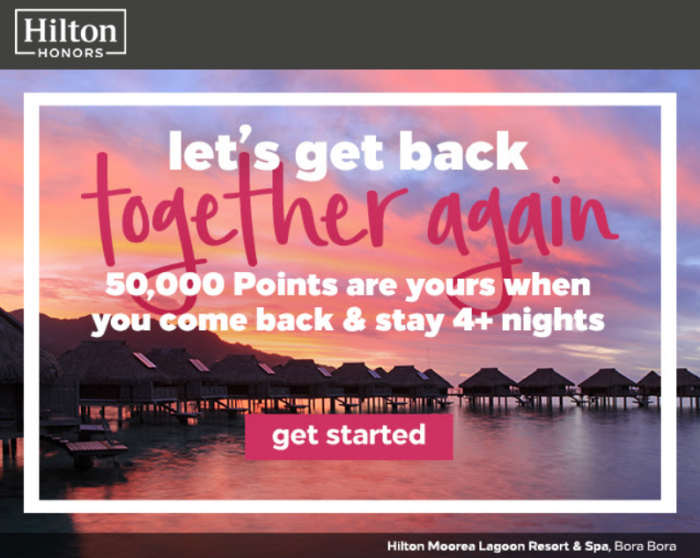 A LoyaltyLobby reader forwarded me an offer that he had received from Hilton Honors offering 50,000 bonus points for consuming four nights within 90 days of registering this targeted Winback-offer. Eligible accounts can register until December 31, 2018, and need to consume the four nights within 90 day period. You can access and try our luck registering for this offer here. I believe that this likely means that my account is not eligible. This look like the offer that I have covered previously but with updated graphics and landing page. Hilton Honors here is likely trying to get members to stay that haven’t had any stays for a while. The reader who received this offer, however, is a Diamond one. Please note this offer is only valid for recipients of the email invitation and is not transferable and is one-time use only. Members who register for the Honors 50 Promotion between now and December 31, 2018 and then stay four nights within 90 days of registration will receive 50,000 Hilton Honors™ Bonus Points. A ‘stay’ is defined as the total number of consecutive nights spent at the same hotel, whether or not a guest checks out and checks back in again. You must provide your Hilton Honors™ account number at the time of booking. Please allow six to eight weeks from completion of your fourth night stay for Bonus Points to appear in your account. This offer may be terminated without notice. Bonus Points do not count toward elite tier qualification. Please allow six to eight weeks from completion of your stay for Bonus Points to appear in your account. A ‘stay’ is defined as the total number of consecutive nights spent at the same hotel, whether or not a guest checks out and checks back in again. Offer is not valid for groups and cannot be combined with other select offers. In-Room Internet Access, Fitness Center/Health Club Access and Bottled Water benefits may not be complimentary at properties with a resort charge. Space-available upgrades only available at select brands. Elite status benefits are subject to availability and vary by brand. For more information, please visit HiltonHonors.com.